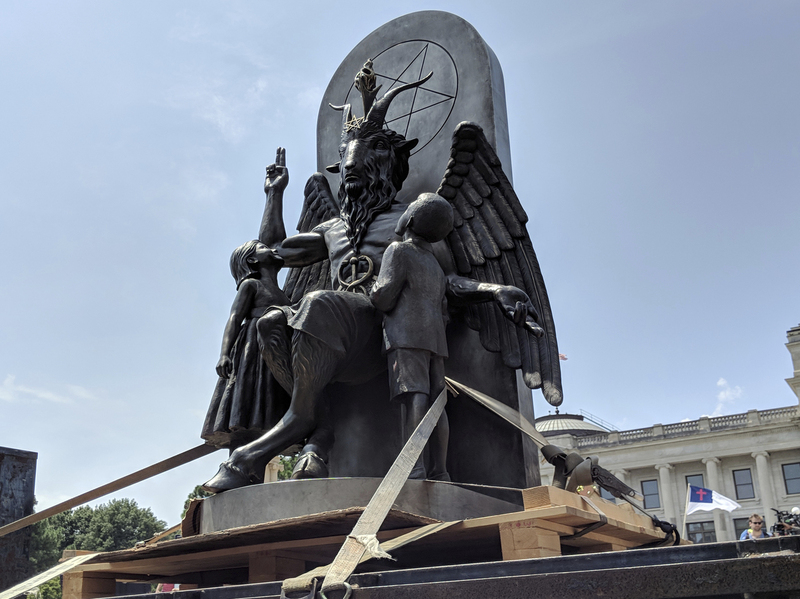 Satanic Temple Protests Ten Commandments Monument With Goat-Headed Statue "It will be a very cold day in hell before an offensive statue will be forced upon us to be permanently erected on the grounds of the Arkansas State Capitol," Republican State Sen. Jason Rapert said. The Satanic Temple unveils its statue of Baphomet, a winged-goat creature, at a rally in Little Rock, Ark., Thursday. The group wants to install the statue on Capitol grounds because a monument of the Ten Commandments was placed there in 2017. It was there, then it wasn't. Like an apparition that happens to involve a forklift, a truck and a 22-hour drive, a bronze statue of a goat-headed-and-winged creature appeared for a handful of hours at the foot of the State Capitol in Little Rock, Ark., on Thursday. "I present to you Baphomet," Lucien Greaves, co-founder of The Satanic Temple, told the cheering crowd that had gathered for the "First Amendment Rally." The 7 1/2-foot figure is a symbol of pluralism, legal equality, tolerance and reconciliation for Satanists, Greaves explained to NPR on Friday. And the reason he had hauled it out of storage to that particular site was to protest another monument permanently installed on the grounds: the Ten Commandments. The Satanic Temple, a national organization with 15 chapters in the U.S. and one in Canada, objects to exclusively Christian religious displays on public property. It argues that public spaces should be free from religious messaging or be opened up to representations of all faiths, including Satanist icons. "We have as little interest in forcing our beliefs and symbols upon you as we do in having the beliefs of others forced upon us," he said from a lectern at Thursday's rally. Republican state Sen. Jason Rapert, who sponsored a 2015 bill that approved the Ten Commandments' placement on the Capitol grounds, told THV 11 that he "respects" everyone's right to free speech under the First Amendment. But, he continued, "The people of Arkansas have the right to say that we disagree with your profane statements ... and really a war on the Ten Commandments." "It will be a very cold day in hell before an offensive statue will be forced upon us to be permanently erected on the grounds of the Arkansas State Capitol," the senator also added. The Satanic Temple isn't the only group opposing Rapert's monument. The group is trying to join a lawsuit filed by the state chapter of the American Civil Liberties Union, which argues that the display is discriminatory and unconstitutional. A judge will determine whether the group can join the case. The half-goat, half-man statue was originally commissioned to protest a Ten Commandments statue in Oklahoma, but a 2015 state Supreme Court decision ruled the 6-foot granite structure unconstitutional, so Greaves withdrew it from the site. Now, he told NPR, "we're focused on Arkansas." As NPR's Bill Chappell reported, "the first version of a Ten Commandments monument at the Arkansas Capitol lasted less than 24 hours before it was destroyed by a car last summer." The same man responsible for its destruction also destroyed the Ten Commandments monument in Oklahoma.